Colonoscopy is an examination of your complete colon, or large intestine. 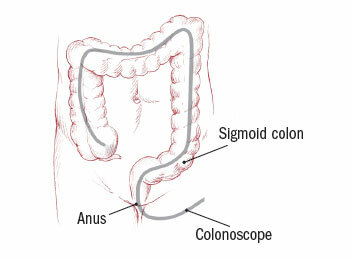 Colonoscopy is similar to another type of exam called sigmoidoscopy, which looks at only the last part of the colon. To perform colonoscopy, your doctor uses an instrument called a colonoscope, which is a flexible viewing tube with lenses, a small TV camera and a light on one end. Through bundles of flexible glass fibers (fiber-optic technology) and a small video computer chip, the colonoscope scans the inside of your colon and transmits images to a video screen. During colonoscopy, your doctor can check your colon for abnormal growths called polyps, sites of bleeding and for other conditions such as colitis. The procedure may take up to an hour and is done in a special endoscopy suite or the outpatient area of a hospital. Although the colonoscope is lubricated and bends easily, you will be lightly sedated to minimize any discomfort.